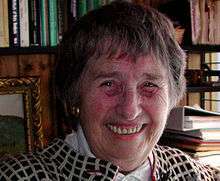 Berit Ås (born Skarpaas April 10, 1928 in Fredrikstad, Norway) is a Norwegian politician, Professor Emerita of social psychology at the University of Oslo, and feminist. She was the first leader of the Socialist Left Party (1975–1976) and served as a Member of the Parliament of Norway 1973–1977. She was also a deputy member of parliament 1969–1973 (for the Norwegian Labour Party) and 1977–1981 (for the Socialist Left Party). She is known internationally for articulating the Master suppression techniques, and her research interests also include feminist economics and women's culture. She holds honorary doctorates at the University of Copenhagen, Saint Mary's University (Halifax) and Uppsala University, and received the Rachel Carson Prize and the Order of St. Olav in 1997. Ås' parents were teachers. Her mother and maternal grandmother were both politically active, and her father was an avid reader and inventor. She completed her university degree in 1953 and worked on issues related to smoking hazards, consumer protection, children's safety, and housing. She taught and conducted research on women's issues at the University of Oslo, where she was an Assistant Professor of Psychology 1969–1980, Associate Professor 1980–1991 and full Professor of Social Psychology from 1991 until she retired in 1994. She has been a visiting professor at the University of Missouri (1967–68), Mount Saint Vincent University (1983), Uppsala University (1989), Saint Mary's University (Halifax) (1997), and St. Scholastica's College (1999). Ås was for several years a member of the Norwegian Labour Party. Her first political office was the municipal council in Asker in 1967. Four years later, she led with Karla Skaare what was later known as the non-partisan "women's coup" in 1971, when women achieved majority representation in three of Norway's largest municipal assemblies. In Asker, this initiative was spearheaded by Berit Ås, Tove Billington Bye, Marie Borge Refsum and Kari Bjerke Andreassen. She was a deputy member of parliament for the Labour Party 1969–1973. She was effectively expelled from the Labour Party during the 1972 EU debate, after which she became the first leader of the Socialist Left Party. She served in the Norwegian parliament from 1973 to 1977, and led several political campaigns, including Women's International Strike for Peace in 1962, the women's movement against membership in the European Union, and others. She was among the first to call for a formal risk assessment of offshore drilling operations in the North Sea. She also made important contributions to the feminist cause in Norway. She led efforts to establish the Feminist University in Norway in the 1980s, and formulated five Master suppression techniques she claims are used against women in particular, though these may be used against other disadvantaged groups as well. She co-founded the Nordic Women's University in 2011. In 1973, she stayed with John Lennon and Yoko Ono in their Manhattan apartment for a week, while participating at the Women's Conference. Lennon had become interested in meeting her after having read one of her speeches; rumor has it that she didn't know who Lennon was. She contributed the piece "More power to women!" to the 1984 anthology Sisterhood Is Global: The International Women's Movement Anthology, edited by Robin Morgan. The Rachel Carson Prize was established spontaneously on her initiative in 1991. ↑ Johansen, Elin Reffhaug (20 May 2008). "Firerbanden er blitt tre". Budstikka (in Norwegian). ↑ "Archived copy". Archived from the original on 2008-04-13. Retrieved 2011-06-16.